Dmytro Khutkyy is a public sociologist, practicing civic activism at E-Democracy Group, Reanimation Package of Reforms (Ukraine), applied research at GoIT education startup and the Center for Innovations Development, National University of “Kyiv-Mohyla Academy” (Ukraine) and academic research at the Institute for Research on World-Systems, University of California-Riverside, USA. He has obtained his Candidate of Sciences degree in Sociology at the Institute of Sociology of National Academy of Sciences of Ukraine. Dmytro Khutkyy has accomplished several international research programs, including the Erasmus Mundus EMERGE Program in Germany, the Carnegie Research Program and the Fulbright Faculty Development Program in the United States. His major fields of expertise include globalization, development, democracy, modeling, forecasting, and social change. 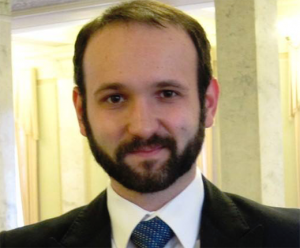 Currently he promotes electronic democracy in Ukraine via research and advocacy activities. Dmytro Khutkyy shares the gained sociological findings via lectures, interviews, articles, and books with the academia and the general public. For a full list of publication please visit www.khutkyy.com.